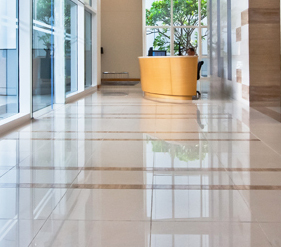 B&B Janitorial Services in Los Angeles offers affordable and professional tile and carpet cleaning services to keep your commercial office spaces looking their best. Our highly trained staff understands the importance of providing complete floor cleaning services to exceed your expectations. Supported by experience and knowledge in the profession, we deliver complete floor cleaning to keep your office spaces looking their best. We understand the importance of having clean floors when customers and clients visit your location, which is why we strive for excellence to get the job done right the first time. We only use the best chemicals and solutions that won’t damage your flooring but will effectively clean your tile and carpet floors. At B&B Janitorial Services, we know the proper tile floor care to keep your floors looking great for many years to come. We won’t just mop your floors, but will clean and protect your tile flooring, such as ceramic tiling. We don’t use abrasive cleaners, but instead special products to maintain the flooring material and finish while producing a luminous shine. We do more than simply vacuum your floors. We offer full service carpet cleaning to keep your flooring looking great. We will shampoo your carpets fully and have the solutions necessary to remove those tough stains. We’ll maintain the quality of the carpet by preventing damage, while we work efficiently to achieve optimal results. B&B Janitorial Services works hard to ensure your flooring is left sparking by providing you with the services you deserve and expect. With our tile and carpet cleaning services, we’ll get the job done right the first time, while saving you time and money. We won’t interrupt the day-to-day operations of your office space while we work with after-hour services. Holding the safest protocols, you can rest easy knowing we will fully clean your flooring while protecting the integrity and safety of your business. Benefit from the best tile and carpet cleaning services in Los Angeles with B&B Janitorial Services. We’ll leave your floors looking better than ever before with our complete and effective floor cleaning services. Call B&B Janitorial Services today for complete commercial tile and carpet cleaning in Los Angeles.